Châteauneuf-la-Forêt in Haute Vienne, Limousin. Over the centuries, the building has been used for many different purposes as consecutive owners have adapted it to their times and needs. Now it is the site of a stunning chambres d’hôtes (bed and breakfast), which has meant that “La Croix du Reh” has come full circle to its original purpose – to give shelter to weary travellers. 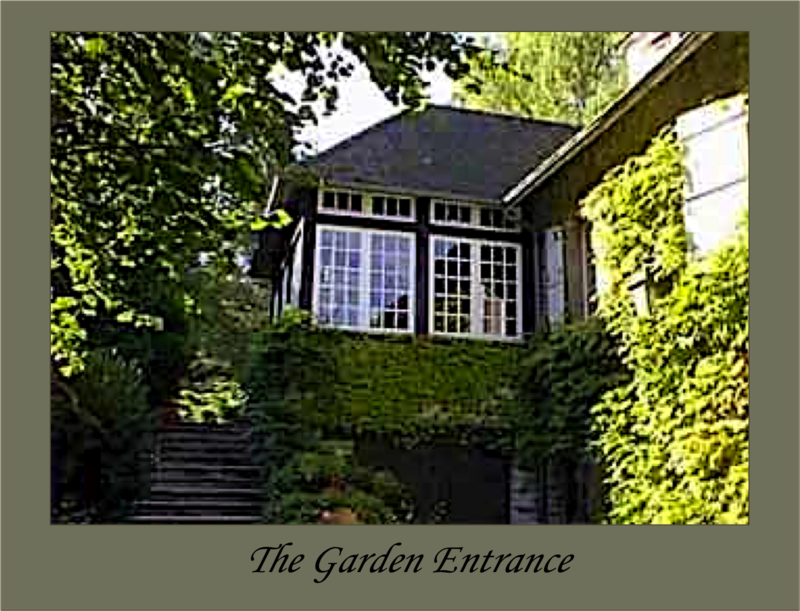 The Garden Entrance to La Croix du Reh is the main entrance to the Chambres d’Hôtes (bed and breakfast), where our guests get their first glimpse of the tranquil three-acre park. At the bottom of the stone steps is our private, secure parking spot that can hold two to three cars and/or several motorbikes, making this Bed & Breakfast totally biker group friendly. 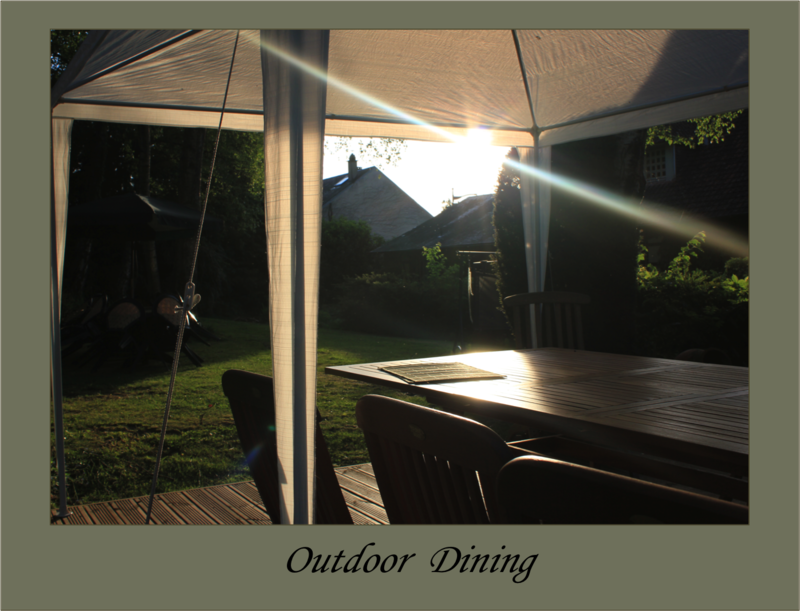 Outdoor Dining in the serene settings of the B&B back of house terrace will bring you closer to nature. Enjoy afternoon tea in the garden or dinner in the open air on a warm spring or summer evening. 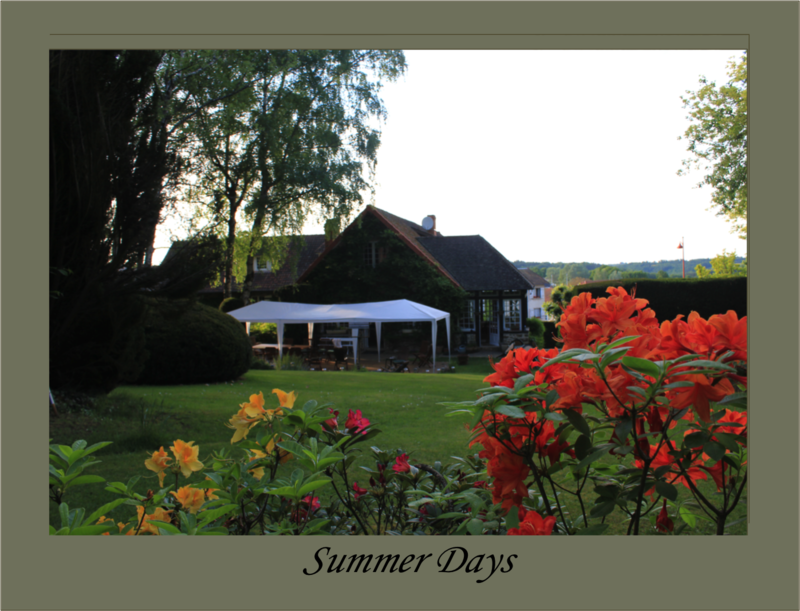 In our Limousin Bed and Breakfast, the guests feel at home as the hosts entertain you and the calm surroundings relax and charm you. 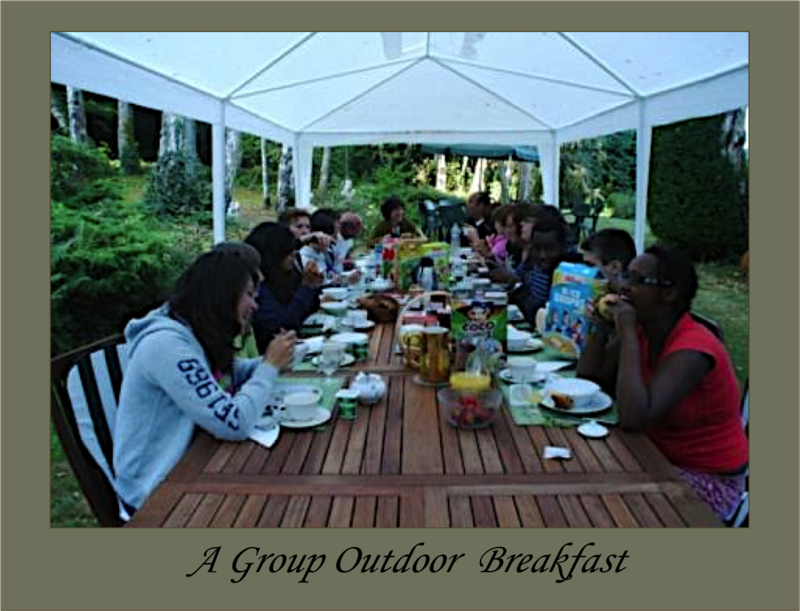 A Group Outdoor Breakfast is possible because at La Croix Du Reh we have enough outside space to allow all guests to enjoy the company of other holiday-makers and travellers when we are full. Larger group reservation for special occasions are welcome and favourable rates can be arranged. Email us for more information. 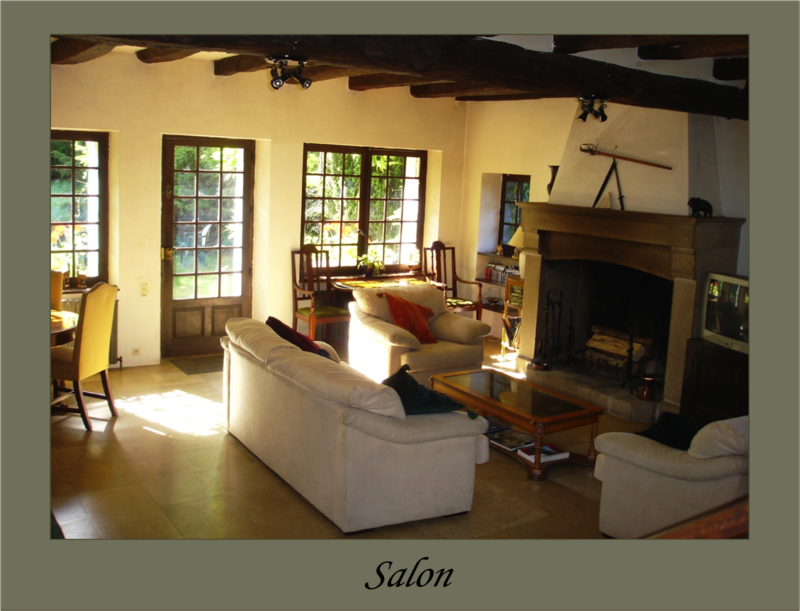 The Salon is the first room inside the Limoges Bed & Breakfast. It is airy and cool during the summer heat and its wood burning fireplace keeps the chills away during the colder winter months. 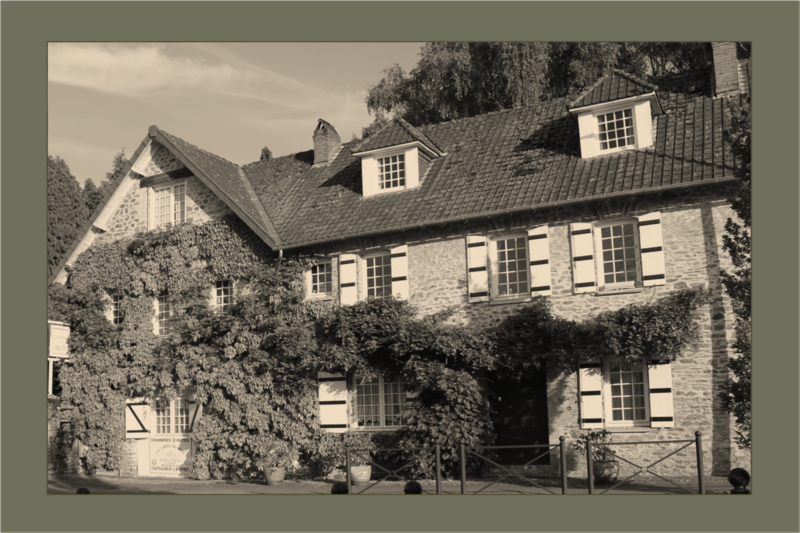 Its original oak beams remind you of the history of La Croix Du Reh and its connection to the Limousin region. 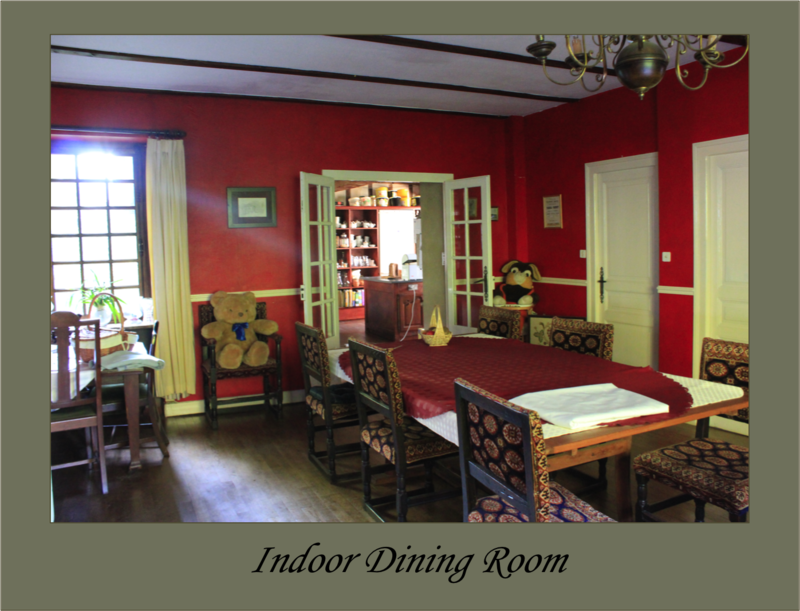 Whilst the inviting atmosphere demonstrates that our Bed and Breakfast is also our home that gives you the warmth and hospitality of the traditional French Chambres d’Hôtes. 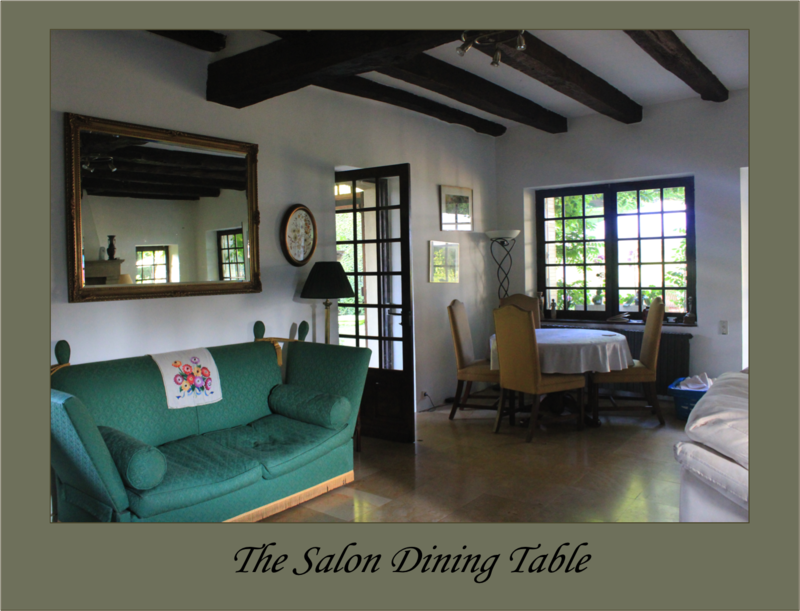 A Salon Dining Table is set up in the corner of the room, by the window and plenty of space in the salon allows for a comfortable stay, whether you want to read, talk or just simply relax. 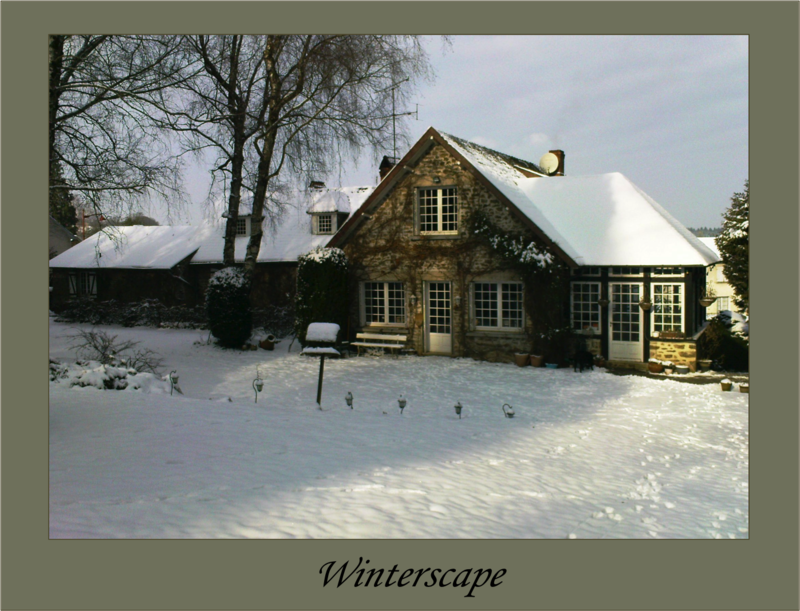 Take advantage of the calm, relaxing setting of the B&B salon when resting from your day’s adventures in Châteauneuf-la-Forêt, Limoges or other parts of Limousin. 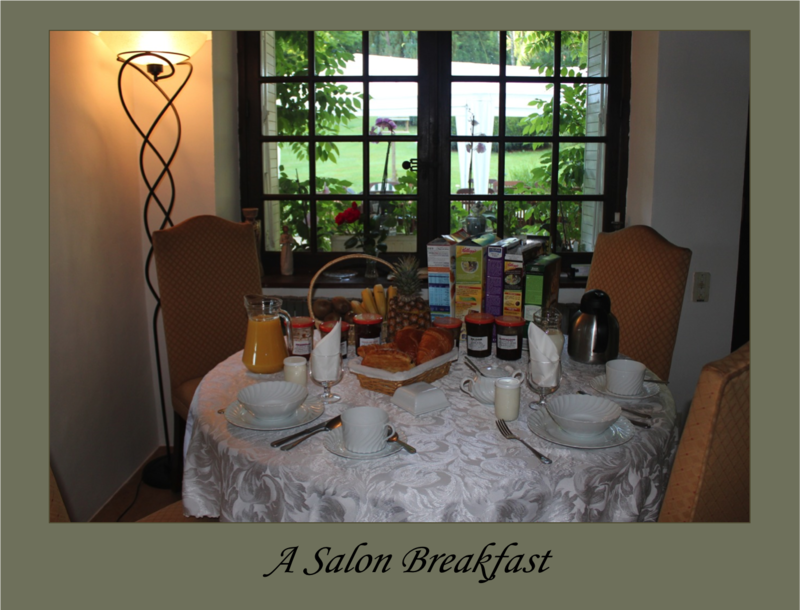 A Salon Breakfast or dinner can be enjoyed at the salon dining table, if you prefer it. The views into the peaceful garden make a perfect dining companion. 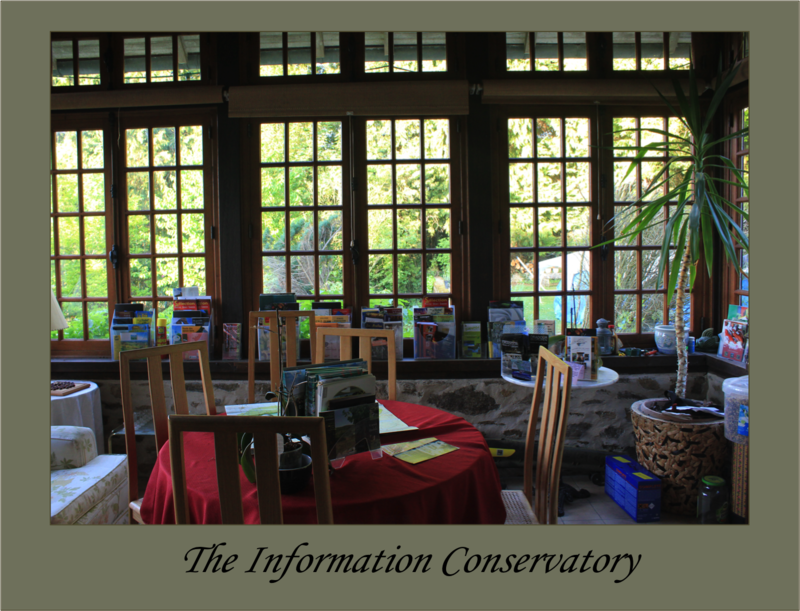 The Information Conservatory is the place in our home where you can find out everything you need about Châteauneuf-la-Forêt, Limoges, Limousin and other local areas. Whether you are looking for a hike, a biking tour, the best restaurants, historical sites and castles, or if you are looking to buy or rent a property in the area, we have taken the time to collect all the information you need. The Indoor Dining Room is a great place to eat breakfast, lunch or dinner. The striking red colour scheme and tasteful artwork adorning the walls provides a unique warmth with which to dine in style. This room of the B&B is closest to the kitchen, where your hunger senses will tingle long before the food is served when the aromas of Galya’s Kitchen quickly fill the space as she begins cooking. 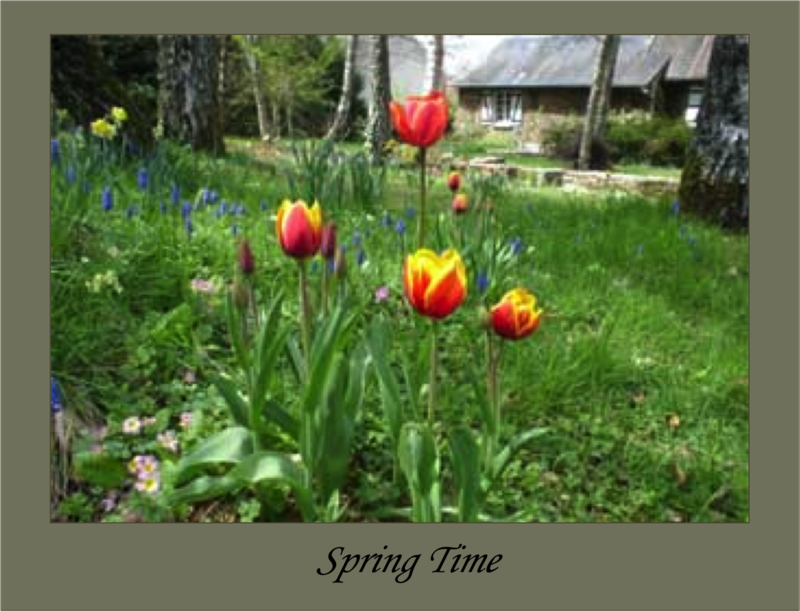 Winter, Spring, Summer or Autumn, our French Bed & Breakfast is open all year around and welcomes guests from across the world. In the harsh winter months, the enchantment of the La Croix Du Reh B&B snowed-over private, three acre garden park is unparalleled. 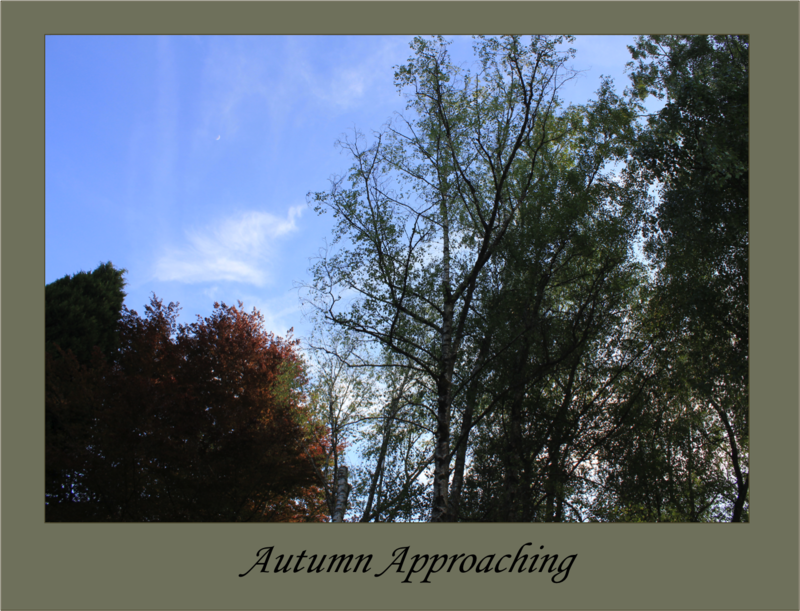 Meanwhile, the greener months will leave you breathless as you hear the sounds of nature when walking around the property. Moreover, the carefully landscaped garden will keep you wonderfully cool in the height of the summer heat. And to keep you informed, while you stay at La Croix Du Reh, we will take the time to give you the latest local weather information every morning. chambre d’hotes – b&b – bed and breakfast Limousin France – Limousin B&B – Limousin France holiday accommodation – Limousin France hotels – hotels Limoges – french holidays vacation in Limousin France – chambre d’hotes et table d’hotes en Limousin – Limousin special place to stay – Limouisn gites – Holiday in Limousin France – special b&b with an evening meal in Limousin France – anglo-french bed and breakfast in Limousin France – stopover Limousin – french holidays vacation in Limousin France – things to do in Limousin France – english speaking french b&b Limousin Haute-Vienne, Creuse, Correze – france property search services and accommodation in Limousin France.